Join us for services with Rabbi Joseph Bronstein in a warm, friendly atmosphere. Our nonjudgmental philosophy embraces everyone, regardless of commitment or religious background. Services are held in a traditional setting, with a contemporary message. 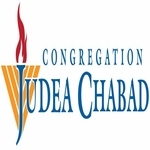 At Congregation Judea we recognize that a synagogue needs to be a second home for our children. Our Synagogue; Imagine worshipping in an atmosphere of total inclusion and acceptance, where you are welcome, in fact encouraged, to ask questions, and where you are implored to be as nonjudgmental of your neighbor as he or she is of you. This is the atmosphere that has been created in our intimate and vibrant synagogue which we call home. Our Shabbat services are traditional. They are led by Rabbi Joseph Bronstein and chanted members of our minyan along with our Rabbi. Our prayer books are written in both Hebrew and English, and the page numbers are announced continuously so you may always catch up if you prefer to meditate at a slower speed. The truth is that only each individual among us knows how he or she best communicates with G‑d. At Congregation Judea the language you use or the pace you set for yourself are not of paramount importance. Services are conducted in Hebrew and English. Throughout the services melodies both old and new are sung, helping to enhance and inspire the prayer experience.